Apostate and heretical teachings seem to never end; there is alway something new with which we are tempted to leave the true faith for a false one. Pastors and teachers are always toying with the ways of the world so as to draw more people to attend their assemblies, regardless how it waters down the Gospel. Lighthouse Trails Research ministry gives a warning about John Ortberg’s book, Fully Devoted. It isn’t something you should be reading if you are looking for the truth, nor are his other books. Ortberg promotes al the contemplative stuff which is the rage now. Oh, and here we go again with new Bible versions!! As if we don’t have enough, charismaniacs have developed the “Modern English Version,” which appears to be nothing more than the KJV cleaned up of 1611 language. It will be coming out next year, so they say. But look at where its promotion comes from - the site of Sam Stoms. The advertisement for his book, The Singing God, should make any Berean cringe. “God loves you—with all your faults and failures, with all the secret sins no one else knows about. In fact, He rejoices over you so much that He breaks out in inexpressible joy and song as He thinks about you.” Oh, really? God just gets all giddy about me? I don’t think this guy really understands the holiness of God. Ahhh, Satan is having so much fun distorting and abusing God’s Word nowadays. I’ve previously done a short review and posted some citations from Keith Gibson’s book, Wandering Stars. This past couple of weeks The Berean Call has interviewed Gibson while discussing the book. TBC has the transcripts for quick reading, with part one here, and part two here. I found an excellent site addressing the lies and logic fallacies of the KJV only crowd. This site has so many articles with excellent research demonstrating that the KJV only idea is total nonsense with no factual support behind it. Just this one page will give you links to a large number of the articles completed by the time it was posted, and if you go to the home page you will be able to look over more recent ones. I did a lot of skimming around through dozens of article and have found this place to be a wealth of information for countering the KJVO cultists. The Mennonites supposedly have a reputation for being quite fundamental, if not even legalistic, in much of their doctrine; there are quite a few in my neck of the woods. Which is why I found it surprising to learn that a Canadian seminary is bringing in Lectio Divina. I guess fads have to be taken up by everyone nowadays. Hey Pope Francis, can’t you control those guys leading your churches? Aren’t you supposed to be in contact with God? Aren’t you responsible for making sure your priests are following Romanist teachings? So why am I always reading about another rogue priest or bishop violating Christian, let alone Romanist, teachings and yet not being defrocked? Now we have a Mexican bishop who is way off base with his teachings on homosexuality. I agree with him that it isn’t a mental illness, since there is no such thing as a mental illness, but to tell a woman that she can condemn herself “because your child was formed that way in your own womb” is a bit bizarre. Bishop Lopez has even affiliated his diocese with a “group that openly promoted the homosexual lifestyle” and saying that he was their spiritual guide. And the Presbyterian Church slides more and more into the devil’s playground as they ordained their first openly “gay” minister. Talk about thumbing one’s nose at God! Finally, I have some great articles to point you towards in regards to the Mormon cult. Two were on Mormon Coffee, the blog of Mormonism Research Ministry. The first one discusses the honesty of Joseph Smith. I think you’ll find plenty of information to demonstrate the the LDS missionary at the door that Smith had very little honesty. The second article gives a good example of how the Mormons dodge teachings which they don’t want to discuss - “that isn’t official.” Well, with the LDS, determining what is official is like trying to make Jello stick to the wall. It’s official sometimes, but then it isn’t, but then it is, but then it isn’t. Janis Hutchinson has an excellent article which is part of a series refuting claims of the Book of Mormon and the LDS themselves in regards to who the white Indians of South America are. Even if you aren’t interested in the LDS, this article has some fascinating history! The following is the conclusion to the article by Keith Gibson, What Must the Jehovah’s Witnesses Do to Be Saved? It was in the July-August 2005 edition of the Areopagus Journal, from the Apologetics Resource Center. It should give you some ideas about dealing with the next Jehovah’s Witnesses that come to your door. Jehovah’s Witnesses, like those in any other works-base group, desperately need to hear the message of grace. Though there is no “sure-fire” method for witnessing, some suggestions might prove helpful. First, build on the Witnesses’s uncertainty of trying to earn Jehovah’s favor. Question the Witness regarding his ability to know when he has done enough. In other words, when he lays his head down at night, how does he know if he has done enough of each activity that day? If he cannot know if he satisfied Jehovah even for a single day, how can he know about an entire life? 1 John 5:11-13 is helpful at this point. No honest Jehovah’s Witness can tell you that he knows he has eternal life as this text says he can. Tell the JW that you know that you have eternal life because you have fully complied with God’s requirements for receiving eternal life. John 1:12, teaches that we must receive Christ for salvation. It is his righteousness and not our own that secures our salvation (Phil.3:9). Share with the JW John 5:37-38; John 6:28-29; and Eph 2:4-9 which make it clear that our works do not save us. Indeed, to attempt to earn salvation by works is in direct disobedience to God’s commands. Finally, and above all, pray. Salvation is a miracle of God. Only God can open eyes blinded by the god of this world. ... Former Jehovah’s Witness, Joan Cetnar says this, “Talk to God about the person more than you talk to the person about God.” Words worth remembering. The following is an excerpt from the article by Keith Gibson, The Book of Mormon: History or Fiction? It was in the September-October 2004 edition of the Areopagus Journal, from the Apologetics Resource Center. Just something to think about the next time a Mormon “missionary” comes to your door. Based on this passage, the potential convert to Mormonism is instructed to read the BOM and pray about it. If done with a sincere heart, the seeker will receive a testimony, supposedly from God, assuring them of the truthfulness of the document. This testimony becomes the basis for the person’s faith that the book is true and Joseph Smith is a prophet. The test is a form of circular reasoning. The conclusion is presumed before the investigation begins. A negative answer is not possible unless the person is not sincere. A person who does not receive a testimony, or who has a negative testimony, is often instructed to read the book and pray again. But is this the right way to test for truth? Secondly, the Mormon is somewhat disingenuous in proposing this test because he would never use it to determine the truth of anything else. For instance, would he be willing to read the Koran and pray about its truthfulness? Why not? The answer should be interesting. Lastly, this is not the biblical means for examining a teaching. Acts 17:11 says, “Now these Jews were more noble than those in Thessalonica; they received the word with all eagerness, examining the Scriptures daily to see if these things were so” (ESV). Notice that the Bible commends these Jews because they examined Paul’s teachings in the light of what they knew God had already said to determine if Paul was bringing the truth. We are never told to determine truth by a subjective experience because the possibility of being deceived is too great. It’s time again to share some of the articles which I found of good value this past few weeks, and which I have permanently bookmarked for future reference. I hope you will find them as thought-provoking as did I. One of the standard atheist/skeptic talking points is that the Bible condones slavery and sexism. This article should provide you with some good responses. Another of the atheist talking points is about God’s “genocide” of the Amalekites (as well as other Canaanite tribes). I found a really good explanation to share with those blindly using such talking points. How do you feel about your wife? Is she your “help meet”? Do you give her the recognition she deserves? Well, surprisingly, I think I usually do. Tim Challies had a good article which made me think very much of my own wife. What do you think, husbands? Perhaps you might do as I did, and share it with your wife while telling her it is how you think of her. Now, this article is just about some interesting history in regards to the Old Testament. Fascinating stuff. Last, but not least, I think Jon Gleason had an excellent analogy in regards to what really makes a Christian. Hint: it isn’t what we wear or what we claim, or even lots of things we do. Wow, it’s been almost two weeks since I last did a “Random” post, and I really have been collecting stuff to warn people to watch out for - some bad stuff to be exposed! First up, more about that book, “Zealot: The Life and Times of Jesus of Nazareth.” This book is rife with Scripture-twisting and other false teachings. On top of that, the author misrepresents himself and his credentials as an author for such a book. Interesting statement from Mark Batterson (Mr. “Circle Maker”) showed up. Did you know that “there are ways of doing church that no one has thought of yet”!? Well, firstly, I didn’t know we were “doing” church - I thought Christians ARE the Church. If he means concocting “worship” services, yeah, there are ways I’m sure no one has thought up yet, but they sure aren’t biblical. Batterson is among the market-driven bunch always looking for more ways to feed the goats. The Pope, who claims he represents Christ on earth, continues to demonstrate just how far he is from representing Christ. He gave Ramadan greetings to Muslims, and said, “We are called to respect the religion of the other.” Wow! Can you imagine Jesus or Paul giving the pagans greetings during their celebrations of their false beliefs? Can you imagine God telling Moses and Joshua that they should respect the Canaanite religions and its “teachings, its symbols, its values”? Islam worships a false god. The teachings of Islam is to conquer everyone and exterminate those who disagree with Islam. Its values includes the abuse of women, terrorism, and extermination of Jews and Christians. And yet the Pope says we should respect all that!?!? Just more proof that Roman Catholicism does NOT represent Christianity. Of course this doesn’t matter to Catholics, whose worship of Mary leads to their seeing “visions” of her everywhere. This is nothing less than idolatry. A favorite icon of Romanists is Mother Teresa. There are many myths about her, but the truth about Teresa leads one to wonder if she was ever saved (I previously noted that she had an exorcism done on her). A month ago I noted that there was a “Wild Goose” festival coming which was a gathering of all sorts of false teachers. Well, it happened, and it was about a degenerate as as it gets. I came across an interesting book review this week. It’s about Tom Horn’s “Apollyon Rising: 2012.” It’s just another “Christian” book sold by “Christian” bookstores so as to make money off of those whose itching ears follow every whim of doctrine. My recommendation - don’t bother. I have previously discussed some problems with the teachings of Chuck Missler, but last week I came across an article exposing his propensity for plagiarism. This is not something Christian teachers should be doing. I’d avoid Missler’s teachings. A couple of my “favorite” false teachers to expose are Joyce Meyer and Joel Osteen (I haven’t done much on Meyer on my blog, but much in real life). Way too many Christians follow the teachings of these heretics, which is why their teachings need to be exposed for what they are - dangerous! I came across a good article discussing both of them, which gives no quarter! 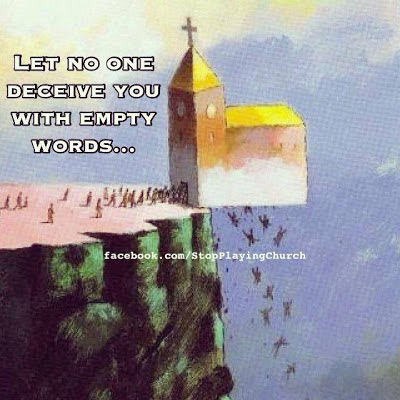 I find many of the comments to be sad, because the commenters are so deceived as to protect these false teachers! Another false teacher I have learned about this past week is Jentezen Franklin. There are just sooooooo many wolves out there that it is difficult to keep up with them. The ELCA Lutherans have gone even farther down the road to complete apostasy: they have now elected a woman as their presiding bishop. Chuck Currie is a well-known false teacher with the heretical United Church of Christ. He has now found a heretical version of the Lord’s Prayer from a New Zealand prayer book, and will be using it in his congregation for “the next several months.” I think it would be virtually impossible to find a real Christian in the UCC. One of the things I was always sadly amused about with the Mormons is their virtual worship of Joseph Smith. I have previously seen hymns giving praises to Smith, and now you can see some of them, as well as other hymns teaching heresy, as posted on the blog of Mormon Research Ministry. 13. P.189, top chart against “NIV, NASB, et al.” 1 Peter 1:24, which is a citation of Isa. 40:6-8. KJV in Isa. does not have the word “man,” but Riplinger doesn’t complain about that! Context of NAS is the “flesh,” so in that case “its” glory is the same as “the glory of man.” NIV says “their glory,” referring to “men” in the previous phrase. Riplinger says, “Having grafted God’s glory on to man, new versions must now keep under wraps the verse which windows the withering of man’s glory.” I’m looking for how the verse is “kept under wraps.” They say the same thing! 14. P.189. Riplinger defines “self-esteem” as coming “from a reservoir of esteem stolen from God.” There is no biblical foundation for this claim - it’s just an assertion by Riplinger. 15. P.189 bottom chart, continuing to P.190, top two charts. These supposedly show God with a “despoiled character” in “new age” versions. First, we weaken His “consuming fire” by changing commands to instructions. a. Matt. 10:5 and Mark 6:8; KJV “commanded” vs. “instruct.” Actually, the word used in new versions is “instructions.” In this case “instructions” seems appropriate. Henry says, “We have here the instructions that Christ gave to his disciples.” So even Henry sees that, in this context, commandment is synonymous with instruction. b. Mark 7:7; KJV “commandments” vs. “precepts.” This verse has nothing to do with God’s commandments; it’s about man’s teachings. Nevertheless, it is quoting Isa. 29:13, which in KJV says “precept”!!! Argument dismantled! c. Matt. 15:4; KJV “God commanded” vs. “God said.” Verse 3 says it’s a “commandment” being referenced in v.4. KJV uses the word “commanded” twice, but the others say the same thing in context! d. Matt. 21:7; KJV “reverence” vs. “respect.” Reverence is a form of respect! The choice of verbiage certainly does not “despoil” God’s character. e. 1 Tim. 4:11; KJV “command” vs. “prescribe.” NIV reads the same as KJV. This is not God, but Paul talking to Timothy. So it doesn’t “despoil” God. Nevertheless, Webster’s says for prescribe: “to set down or give rules, directions, etc . . . . syn. - direct, order, require, command, enjoin.” [my emphasis]. So where is the problem? Henry adds some more insight: These confessions of our faith ought to be made with meekness and fear; apologies for our religion ought to be made with modesty and meekness, in the fear of God, with jealousy over ourselves, and reverence to our superiors. g. Luke 9:43; KJV “mighty power” vs. “greatness.” I read these as synonymous, but, if not, how does it “despoil” God? h. Matt. 2:6; KJV “shall rule” vs. “shall shepherd.” In context they are synonymous. A shepherd “rules” his flock. But does it “despoil” God? i. Matt. 4:24; 9:26; KJV “his fame” vs. “news.” In this context “fame” and “news” are synonymous. After all, the N.T. is about the “good news” of Jesus, not “good fame.” Does “news” “despoil” God? l. Titus 1:4; KJV “mercy” vs. “OMIT.” In NAS/NIV God’s “grace” is from love. No love has been removed. m. Heb. 3:10; KJV “grieved” vs. “angry.” Anger is not necessarily loveless! n. 2 Cor. 6:9; KJV “chastened” vs. NAS “punished.” Webster’s defines “chastened” as “corrected; punished; purified from faults.” I punish my children because I love them. p. 2 Cor. 12:21; KJV/NIV “humble” vs. NAS “humiliate.” Henry says, “[Paul] was grieved at the apprehension that he should find scandalous sins among them not duly repented of. This, he tells them, would be the cause of great humiliation [my emphasis] and lamentation.” Webster’s defines “humiliate” as “to humble.” Case closed! This sounds like Christ is saying, “stop clinging to me, detaining me.” How has this removed love? r. Acts 7:30,35; KJV “bush” vs. NAS “thorn bush.” Vine’s says the word “denotes ‘a bramble bush’,” as does Thayer’s. What if it was a rose (thorn) bush? What does the type bush have to do with love? Can God not use a thorn bush in love? Are thorns a natural sign of hate? This is a clear case of Riplinger assigning a meaning to something where the scriptures are silent! 16. P.190. Now Riplinger claims that self-esteem promotes “lovable people” who won’t “strike him, accuse him, or constrain him” - meaning that passages showing this abuse of Christ are omitted. Of course she finds only three verses in her attempt to support her case. Assuming there is no valid reason for these omissions, they are still an unrepresentative sample. a. Luke 22:64. The phrase, “they struck him on the face,” is omitted, but the question, “who hit you?” necessarily requires that someone did so! b. Luke 11:54. KJV “that they might accuse him” ends the verse, “Laying in wait for him, and seeking to catch something out of his mouth. . . .” NAS says, “plotting against Him, to catch Him in something He might say.” NIV says, “waiting to catch him in something he might say.” It becomes OBVIOUS that the purpose is to make an accusation. Omitting the phrase, “that they might accuse him,” doesn’t take away the obvious! c. Luke 22:68; KJV “nor let me go” is omitted in new versions. Jesus is saying that they will continue to restrain him even if he answers their questions. Again, omitting this phrase doesn’t alter what took place. Jesus remained restrained! Lovable people would have released Him. The argument is foolish. 17. P.191-192 chart which purportedly gives man a healthy self-image by deleting references to his sin. a. Col. 3:6; KJV’s “on the children of disobedience” is omitted. The label, “children of disobedience,” is not a necessary addition. Read the CONTEXT! Paul is telling them that all this stuff (NIV “sexual immorality, impurity, lust, evil desires and greed, which is idolatry . . . anger, rage, malice, slander, and filthy language”) is wrong; i.e., sinful. This certainly isn’t promoting a “healthy self-image” just because they weren’t labeled as “children of disobedience”! b. Eph. 4:22; KJV “is corrupt” vs. “being corrupted.” In context they are saying the same thing; the old person is corrupt and being corrupted by the old way of life. There is no hint that “being corrupted” implies man is not corrupt - or has a “healthy self-image.” Riplinger is reading into the text. c. Mark 15:28. The phrase is omitted from NIV, but not the NAS. NIV footnotes it anyway. But the phrase refers to v.27 which describes the men as robbers. Do we need to also call them “transgressors” to take away their “healthy self-image?” If I was to make a complaint about this omission, it would be because it removes a reference to prophecy that is nowhere else in the Gospels! d. 1 John 5:19. This charge is ridiculous. Can Riplinger tell me the difference between “in wickedness” or “under the control of the evil one?” No promotion of a “healthy self-image” either way! e. Luke 5:20; KJV “man” vs. “friend.” I suppose that, by calling the man “friend,” Riplinger could argue that this helps his self-image, but how does this delete a reference to sin? f. Acts 17:22; KJV “superstitious” vs. “religious.” The context is Paul addressing their pagan religions. They are worshiping idols and false gods. This is a religion and they are religious. In this case, religion and superstition are synonymous. But how does this promote self-esteem or delete sin? g. Matt. 15:8. Omission of the beginning phrase from Isa. 29:13. The parallel passage is Mark 7:6-8, which phrase even KJV omits. The passage is easily understood apart from the phrase. There is no promotion of self-esteem or deletion of sin! i. Phil. 3:21; KJV “vile” vs. “humble.” Henry says, “The body is now at the best a vile body, to soma tes tapeinoseos hemon - the body of our humiliation. It has its rise from the earth, it is supported out of the earth, and subject to many diseases and to death at last.” Sounds like “vile” or “humble” both work. I don’t have a clear understanding of what Riplinger sees as the difference here, but the change certainly doesn’t fit the charge of promoting self-esteem or deleting sin. k. 1 Cor. 10:1; 12:1; 2 Cor. 1:8; KJV “ignorant” vs. “unaware.” Webster’s defines “ignorant” as, “uninformed or unaware.” So where’s the problem? I guess by not using the word “ignorant,” it appeals to self-esteem? NAS and NIV both footnote to be like the KJV. There is no self-image help here! m. Rom. 1:22. KJV’s “themselves” is omitted. But, “Professing to be wise, they became fools” is, by context, addressing “themselves.” Who else is “they?”!!!??? n. Rev. 12:12. KJV “woe to the inhabitants of the earth” vs. NAS “woe to the earth.” The context is addressing the people! a. 1 Cor. 4:4 complaint only against the NIV and NASB. While they do seem to say something different, they have nothing to do with haughtiness or humility. b. Job 42:6, NAS complaint. d. Luke 9:55,56 omission. NAS does have these verses, and NIV footnotes them. Even so, NIV v.55 says “Jesus turned and rebuked them.” This sounds to me as if He just humbled them rather than built up their self-esteem. 19. Pp.193-194; the claim that sin is being squeezed out. All one has to do is to read the N.T. in any new version to see constant references to sin, so even if these nine examples are valid examples of “squeezing out sin,” they are a small/unrepresentative sample. a. Col. 2:11; KJV “sins of the flesh” vs. NAS “the body of the flesh.” In context, both say the sinful nature is being removed. b. Isa. 53:10; KJV “sin offering” vs. “guilt offering.” Isn’t the guilt offering because of sin? c. 1 John 3:5: KJV “our sins” vs. NAS “sin.” NIV reads as KJV. “Sin” has not been removed! d. Heb. 9:7 “not in Greek” vs “committed in ignorance.” Apparently Riplinger is saying that by saying the sins were committed in ignorance, the sin is being “squeezed out.” Well, in my TR interlinear, it most certainly is there. It says, “he offers for himself and the ignorances of the people.” Argument dismantled. e. Matt. 18:7; KJV “offenses” vs. NAS “stumbling blocks.” NIV says “sin”! In context, I believe NAS and KJV are saying the same thing. Sin is not being squeezed out. While the new versions don’t emphasize “our” sins in the statement, the context is certainly about “our” sins. Where is the “squeezing out” of sin? g. 1 Peter 4:1; KJV “suffered for us” vs. “suffered.” Anyone reading 1 Peter in its entirety will see that the context of 4:1 is indeed “for us,” whether stated here or not. This still doesn’t fit the charge of removing sin. i. Luke 22:19-20. “which is given for you.” NAS and NIV both have this in the text, regardless of the footnotes Riplinger doesn’t like. Again, Riplinger only refers to footnotes that she can use for her claims, not those that go against them! It sounds to me that Henry sees the purpose for themselves in the counsel . . .against themselves. a. Replacing KJV words with “proud” or “boastful,” leading to self-esteem. b. Use of words with the prefix “self” to focus on self. c. Use of the word “likeness” exalted man to be like God. e. Use “slander” instead of “blasphemy” to reduce the seriousness. f. Changing “Godhead” to “divinity” raises man to be like God. g. References to God have been removed to build a pedestal for man. i. Passages give man divine power, precluding the need for God. j. New versions graft God’s glory into man. k. New versions “despoil” God’s image. l. New versions delete references to sin so as to prop up self-esteem. m. New versions teach haughtiness vs humility. n. New versions “squeeze out” sin. No matter how many passages we looked at, there was not a single one which even hinted at promoting self-esteem. Almost all of the passages in new versions read the same as KJV when context was considered. Of course, as we have seen continuously in this review, Riplinger does not seem to be able to understand the context of passages. As with the other chapters, Riplinger practices a great amount of eisegesis in her attempts to prove her case. The verdict for Chapter Ten is the same as for all the previous chapters: Riplinger hasn’t a leg to stand on in any of her charges. Midwest Christian Outreach has a good article about deception, and how it wrecks people’s lives. All cults use deception to gain and hold converts. MCO uses the Jehovah’s Witness as one of their examples. Going along with deception, the Watchman Fellowship has an article (a “Profile”) explaining common patterns in cults. Worth examining. Speaking of deception and the Jehovah’s Witnesses, Jon over at Mind Renewers has been writing a series on the false teachings of the JWs. Take a look at Part One, and you should have your appetite whetted for the rest of the series. When it comes to deception, cults aren’t alone in using such tactics; the Roman Catholic Church has been a master of deception for centuries! With them, it is a case of the blind leading more blind astray. This week I was linked to an article in which the author discusses the RCC deception of praying to Mary, and why it is problematic. I previously address this issue in my article, “Mary, ‘Mother of the Church,’ Is Not the Mary of the Bible.” If you missed that article, I recommend you review it if you want to learn more about the Romanist Mary and why she is unbiblical. Speaking of the Romanist Church, it seems that a Catholic school in California fired one of its teachers because he “married” another guy, stating that the relationship is not compatible with Church teachings. He’s been a teacher there for 17 years. I think they are going to lose this case - and should. It seems the guy has been in this relationship for ten years, and the school knew about it; it is only because he is now “married” that they have a problem with it. Their claim is that they don’t discriminate against “private lifestyle choices,” but the new “marriage” has made it public. So let me get this straight; if this man was involved in any “private” sexual immorality which the school knew about, they would still let him teach there. But if it becomes public he can’t?!? This is rank hypocrisy! The man should have been fired ten years ago when they learned of his relationship. They should have known better. If they want to make it a rule that sexual immorality makes them unable to teach, then it shouldn’t matter if it is public or private. The Mormons claim that the original plates of the Book of Mormon were inscribed using a language called “Reformed Egyptian.” Of course there is no evidence of such a language ever existing. Someone who works with Mormons decided to write a Wikipedia article about “Reformed Egyptian” so anyone searching can see what a fraud it is. Now that I’m on the subject of Mormonism, I am SHOCKED to learn that they are actually becoming soft of the subject of homosexuality. As strong as they have been against homosexuality throughout history, to learn they are becoming supportive of it is something I never dreamed would happen. I guess I’m a bit behind the times on this, because one of the articles Mr. Stone links to is dated September 2011, when the church put a “gay” Mormon in a leadership post. The United Methodist Church General Board of Church and Society seems to have no end to their apostate activities. If you are a member of the UMC and read this article, explain why you are still a member of that denomination. As Neil says, they are beyond parody. I keep reading articles about a new book, “Zealot: The Life and Times of Jesus of Nazareth.” There has been much exposure about the author’s lack of credentials, and much more exposure about the book’s revisionist history. Denny Burke has a good article about why he isn’t reading the book, and I have to agree with him 100%. Now it’s time to look at some false teachers in the news. Mark Driscoll. What can I say? And yet he is still seen as a worth teacher. Neil Anderson is extremely popular with the “Deliverance Ministry” crowd, and sells books by the thousands - all rife with unbiblical and false teachings. For those who aren’t aware of his bizarre teachings - and why they are unbiblical - I suggest a perusal of this article. And here is an article about someone who obviously listens to false teachers. She says it is against her religious beliefs to process a gun for shipment. I wonder what religion she follows. Finally, some humor to send you off with. It’s a good parody of what passes for “praise” songs in so many churches today.